Find hotel near Summer House Backpackers ..
A convenient budgeted stay for the backpackers which is strategically located and has all the facilities you look out for. Mixed gender and female only dorms are available with a communal kitchen; lounge for television, barbeque area, a dining room and laundry. They give complimentary breakfast as well. It is a simple accommodation which is good enough as it is neat and well kept. The beds are comfortable and the staff is welcoming. The view from the rooftop is definitely nice. So, you can stay at this house when looking out for not something fancy. Top rated Brisbane City tours do not include Summer House Backpackers Brisbane in their schedule, you can add it to your plan anyway. Use Brisbane City trip planner to visit Summer House Backpackers Brisbane and many others to your visit. You can enjoy a comfortable stay in the city by booking the best hotels in Brisbane City like Kangaroo Point Holiday Apartments, Allegro Apartments and Ibis Brisbane. 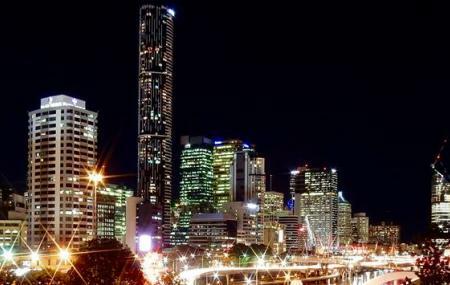 Curated Brisbane City vacation packages await! Book the best ones and start turning your dream into reality.Discover various ways for how to reach Brisbane City and complete the booking by choosing your mode of transport. This time I was in a 4 beds dormitory. I've found it cleaner that the last time. Always nice stay there. Staff is very kind and helpful as ever. I've added one more star. Very nice. My experience here was really good! The atmosphere was fun, and the dorms were pretty nice for how many people were in it! The lockers were plenty big enough for my backpack and it’s always nice to have your own sockets at your bed. The women’s bathroom was pretty clean, but the ventilation system wasn’t the best so it would get really hot in there. Kitchen was nice and the rooftop was also good! It is a little bit of a walk to get to any of the main things to do, so be prepared for that! Staff was very helpful to me when I needed to find a tailor, a request they’re probably not used to. The only redeeming quality of this hostel is the politeness of most of the staff. I’ve been travelling and living in hostels for over a year now and never stayed in a hostel with bed bugs before. Upon arriving two girls in my room were busy washing bin bags of their clothes and sheets, when asked they confirmed they had bites all over their bodies from bed bugs. When I went to sleep I also woke up with the same. When reception were initially informed the girls said the response was “it must have been brought from other hostels and places like noosa”. Both me and the two girls had just arrived from different hostels in noosa, neither of which had bed bugs and nothing was mentioned by anyone about them. The cleaning response was to cut off the plastic covering of the mattress and put a new one on, even though the bed bugs were furrowed inside the mattress, this would only contain them for a while.? Following this the reception opens very late in the day. Meaning, despite having a flight to catch at 7:30am, there was no way of me obtaining my $25 dollars key deposit back, nothing was mentioned of this beforehand. Apparently it is advised to hand it in the night before, if you have to leave in the morning. Which makes absolutely no sense as, who would let me in and out of my room that night? This hostel is branded ( by the hostel ) as ‘clean’. It is far from it. A shame because the potential and staff are decent and friendly. Overall very disappointing and the worst hostel I’ve stayed in for over a year across Australia. A nice rooftop area, and air con are about the only highlights. Thought the air con is automatically set so low, unless you’re in bed under the covers, you have goosebumps on your arms, unable to change temperature. Will not be recommending to anyone, and will advise against going unless you want to wake up in the morning covered in bites. The least you expect from a hostel is a clean bed. Great price, very comfortable beds and good location. However the people staying in the hostel were not friendly at all. I walked into my room and no one even said hi or looked at me. The room was extremely cramped, I didn’t even have space to put my bag because the long term stays took all the space available. When I checked in the girl didn’t mention I had to bring down all my sheets when checking out. The kitchen is extremely small.